They will provide 5,000 EXP for ANY character they are given to. If you still haven't filled that INT slot in your Slasher or you want a start to your INT Teams, Buggy is the perfect place to start, Farming Buggy here will be better than Story-mode due to the higher drop-rate. Also available as a Mini-boss, Cabaji can fill both DEX and Slasher teams. There is a chance Moji can appear instead of Kabaji. Care of his Moji(Heart) / Kabaji (Technique) mini-bosses ! As they are INT [ ] -Units, You will want to use PSY [ ] -Units on your team. Using Sogeking/100 Ton Hammer Usopp's Turn Delay will give you so much time, you won't even know where the enemies disappear. As Buggy is an INT Character, we expect PSY Units to have an easier time than usual dispatching the many purple units and Boss that await. For this team, using Usopp and Shanks is highly recommended. Buggy will do quite a bit of damage so having a little bit of tankiness is essential. Ashura Zolo lead will be pivotal in this team's success - if not, Slasher and PSY Teams will be better. 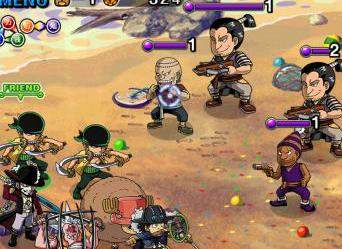 The Slasher team will stand a good chance against the Forces of Buggy. 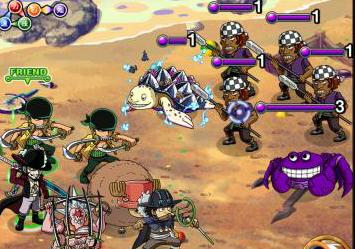 Use Arlong as lead until you have Mihawk. The Zeff Fighter team will stand a good chance against Buggy with 6.25x ATK. Still. 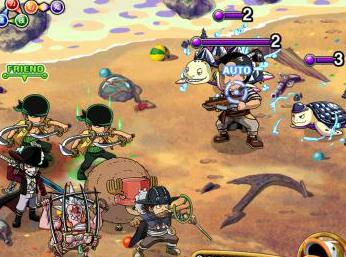 If you have a high stated Arlong, use Arlong Team since there are no good Heart Fighters to use the ATK from. Best way to use her, since all of the Last Stages Enemies will deal 0 damage to you. 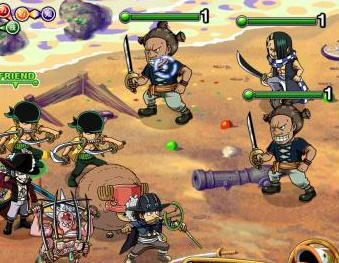 These are stages with regular pirates that varies in colour. The black skull shows that he can one hit kill you to gameover, because his damage will overkill your HP gauge !!! So focus him first and finish off the rest as you want to. He can appear with 2, 3 or 4 Turns delay. When he is at 2, Finish him off without trying to combo. Wait until one character has hit his attack fully and tap another one. Repeat to make use of your Max. Hits on him. If possible, slice down the other Shooter as well. You can chek on Characters Section of the Blog to view how many "Hits / Combo" a character has. As you can see they deal almost the same amount of damage so focus on the Pirates first, since their HP is lower to fight Kabaji alone. 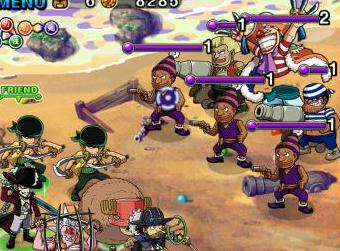 Buggy the Clown with come with "mobs" of varying shapes and sizes - all purple. Target the 1-Turn Pirates first and you will be fine for the most part. If you have 4.000 HP. 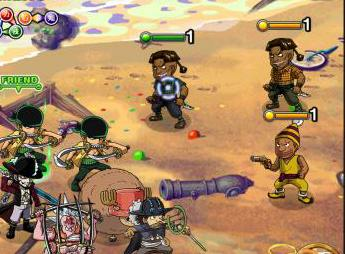 you can survive 2 Attacks of the pirates. In my Team i finish off the 3 low pirates first. let the big 2 attack once and use my "Sanji Rock Stew" to heal back a bit. Important: Use Usopp 3 turn before you get defeated. Stage 3This stage comes in 2-Forms either 3 Big Purple Turtles or 5 Purple Baby Turtles. 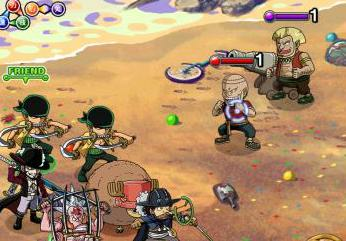 Try to Heal afterwards while fighting Crab down to 1 turn and kill, before it attacks again. 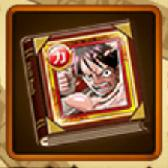 Important: Use Usopp 3 turn delay now. Attack the heck out of Buggy.